2.1 How to Add Memory and an AirPort Card to the iMac G3 Slot-Loading DV+ 450 Hz? Introduced on: July 19, 2000. Processor type: PowerPC 750 “G3”. On-Board Ram: 64 MB or 128 MB (Expandable to 1 GB (512 MB supported by Apple). Graphics: ATI Rage 128 Pro with 8 MB of VRAM. Storage: 20 GB, 5400-rpm ATA-3 up to 128 GB Hard Drive Supported. Input\Output: 2x USB 1.1, 2x FireWire 400 2x Headphone mini-jacks. Analog audio input mini-jack. Built-in stereo speakers. Internet \ Wireless connection: Optional 11 Mbit/s AirPort 802.11b (adapter required), 10/100 BASE-T Ethernet, 56k modem 4 Mbit/s, IrDA. Preinstalled OS: 9.0.4. OS max. upgrade: 10.4.11. Apple Order number: M7647LL/A – Indigo, M7652LL/A– Ruby, M7676LL/A – Sage. How to Add Memory and an AirPort Card to the iMac G3 Slot-Loading DV+ 450 Hz? Unplug all cables, except the power cord. Place the computer face down on a soft cloth. Open the access door using a coin to turn the latch. Touch the metal shield inside the recessed latch area. Touch the metal shield before you touch any parts inside the computer. Don’t walk around the room until you’ve finished installing memory or an AirPort Card. module with the small notches inside the slot. To install an AirPort Card, detach the antenna from the guide rail, then remove the protective plastic cap. Warning: You must have an AirPort-compatible iMac to install an AirPort Card. If you don’t see the guide rail, your iMac is not compatible with AirPort. Connect the antenna firmly to the AirPort Card and insert the card sideways into the slot. For instructions on using the AirPort software, look in the Help Center, available in the Help menu of your computer. Close the access door and use a coin to close the latch. Warning: Never turn your computer on unless all of its internal and external parts are in place. The guidelines in this section can help you work more comfortably with your computer. For detailed information about ergonomics, see Apple’s Environmental Health and Safety Web site. When you use the computer keyboard, your shoulders should be relaxed. Your upper arm and forearm should form an approximate right angle, with your wrist and hand in roughly a straight line. You may have to raise your chair so your forearms and hands are at the proper angle to the keyboard. If this makes it impossible to rest your feet flat on the floor, you can use a footrest with adjustable height and tilt to make up for any gap between the floor and your feet. Or you may lower the desktop to eliminate the need for a footrest. Another option is to use a desk with a keyboard tray that is lower than the regular work surface. Use a light touch when typing and keep your hands and fingers relaxed. Avoid rolling your thumbs under your palms. Position the mouse at the same height as your keyboard. Allow adequate space to use the mouse comfortably. An adjustable chair that provides firm, comfortable support is best. Adjust the height of the chair so your thighs are horizontal and your feet flat on the floor. The back of the chair should support your lower back (lumbar region). Follow the manufacturer’s instructions for adjusting the backrest to fit your body properly. Arrange the computer so the top of the screen is slightly below your eye level when you’re sitting at the keyboard. The best distance from your eyes to the screen is up to you, although most people seem to prefer 18 to 28 inches (45 to 70 cm). Position the computer to minimize glare and reflections on the screen from overhead lights and windows. Warning: Don’t lift the computer using the flip-out foot. You could damage your computer. To move your computer, grab the handle on the top of the computer with one hand; with your other hand, hold the bottom of the computer. Also remember that electrical equipment may be hazardous if misused. Operation of this iMac must always be supervised by an adult. Do not allow children access to the interior of this product and do not permit them to handle any cables. The processor speed in Summer Series iMacs G3 was being increased with 50 Hz increment. Not a spectacular digit nowadays, in multi-cored processors era, but back then it helps to boost the performance a lot. The Summer Series iMacs G3 booted with a special tune you can find on Youtube. Sell this iMac or any other iMac for fast cash: We buy iMacs for the best price online! 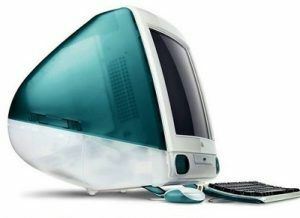 Sell old iMac now!